After a while without a Classic Children's/YA post, have got some really good ones lined up - starting with Leah from the brilliant Uncorked Thoughts blog today! Number of books: Oh gosh. So many. The Babysitter’s Club was an absolutely massive series. 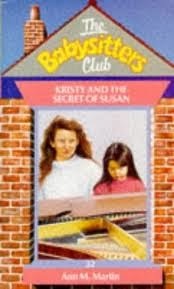 There is 131 of the series, but Ann M. Martin also wrote The Babysitter Club: Specials, The Babysitter’s Club: Mysteries, The Babysitter’s Club: Little Sister and The Babysitter’s Club: Friends Forever. The ones that I’m talking about at the moment though is the straight series – they used to come in bumper packs of 3 books in 1. Heaven for a young bookworm! Availability: Print copies are available via Amazon and The Book Depository. Amazon has a few of the books on Kindle too. The Premise: “The series is about a group of middle school students living in the fictional town of Stoneybrook, Connecticut. They run a business called the Baby-sitters Club that helps parents find babysitters from the club who are available for jobs by calling during their club meetings. The club starts out with four members Kristy Thomas, Mary Anne Spier, Claudia Kishi, and Stacey McGill, eventually expanding to ten. Most of the main characters are thirteen years old. When the club was founded (1986), the four members were in the seventh grade, but ten novels later (1988), they are promoted to the eighth grade. From there, they are frozen in time until the very end of the series (2000), in which they graduate from middle school.” – Wikipedia. Why I Really Like It: Aw for so many reasons! Each book is narrated by a different babysitter so you never get bored of the same narrative voice and each character is similar to someone that you already know. I used to love imagining which babysitter I would be if I was in the books. It kept a young me occupied for hours. It was the very first series that I read and fell in love with (next to The Famous Five). Each girl was so relatable and I loved reading about their little adventures. They were short and sweet books and completely fun. Some of the events that I read about are still stuck in my head now. It makes me wonder if I’d be as into reading as I am now if my parents hadn’t bought me so many of these books! Best Books: Yikes. Erm. I loved all of the books which featured Claudia mainly, and Dawn. They were my absolute favourite characters. I didn’t have a favourite book - there are far too many to pick between them! Who It Will Appeal To: Contemporary lovers. They were quick and easy reads. I remember falling in love with the characters. The babysitting was merely what the gang of girls had in common – they went on many adventures. Others By The Same Author: From searching through The Book Depository, there seems to be a couple that she did outside of the series: a series named Main Street. Here’s the link to Ann M. Martin’s Scholastic page with more info. Leah can be found on Twitter, and at her brilliant blog Uncorked Thoughts.